Depression of freezing point (FPD). 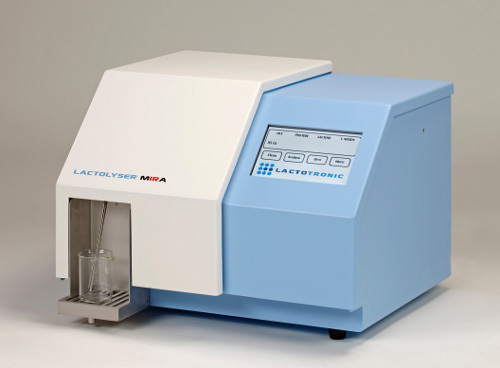 The Lactolyser MIRA is an excellent milk processing equipment for accurately analyzing dairy samples. The intuitive user-software and the general easy operating of the instrument enable a maximum of efficiency. Just a one-button operation for most of the measurements. The user can select one of the preset products or can use the Smart Calibration Option. With this option the milk analyzer measures and determines by itself what product file has to be used for the particular product. After a preset time, the MIRA automatically cleans itself to prevent contamination or even blockage of the fluid mechanics, no operator action is required for that. An automatic zero setting is conducted after a preset time as well.